U.S. Chess Championship 2015 - countdown! 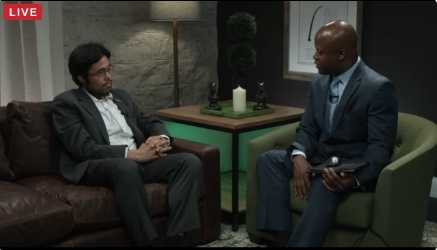 HIKARU NAKAMURA is the 2015 US Champion! Gibraltar, Zurich and now the US Championship. So far, it's been Hikaru's year. Hikaru conquered the US Championship by winning round 11 against Alexander Onishuk, in a pretty amazing way. The game looked drawn, and everyone knows how solid Onischuk is in such positions. But the old lion miscalculated in a drawish endgame, and nobody can allow himself that when playing the number 3 in the world. Robson did his part, beating Timur Gareev in a crazy game, and until Onishuck's blunder, we were all preparing for the playoffs. Nakamura said that the tournament wasn't easy for him: when playing much lower rated opponents, you need to push it hard and try to win every game. But Hikaru was able to play well, and grabbed his fourth national title. Welsey So, once again, showed he wasn't affected too much by the incident in round 9, and won against Troff. Irina Krush, after an up-and-down tournament, managed to draw the last game against Nemcova, winnning her 7th Championship title. Congratulations to the champions! GM Alex Yermolinsky recaps the first 5 rounds. GM Alex Yermolinsky's final recap of the Championship. 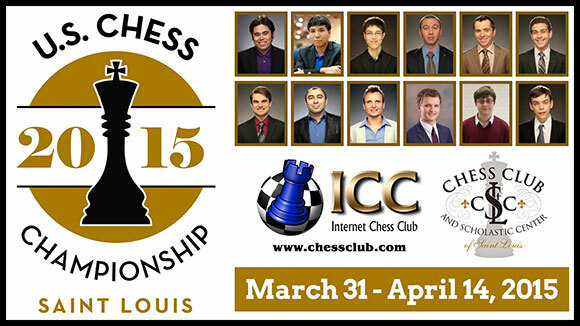 The 1st of April the strongest U.S. Championship ever starts at the swift Chess Club and Scholastic Center in St. Louis, Missouri. The tournament's format is a 12-players Round-Robin (11 rounds). Games start April the 1st, at 2:00PM EDT. Only rest day is April the 6th. Playoffs, if needed, on April the 13th. The ICC will present his members with two LIVE shows, in which GM Alex Yermolinsky will recap the events in the tournament. These shows are scheduled for 12 noon EDT on April 6th and 13th. Also, a daily video recap will help those who have not been able to follow the action live. Number three in the World, GM Hikaru Nakamura, is the favorite, even considering how well he's been playing in the last tournaments he participated in. Wesley So, currently 8th in the FIDE rating list, is going to be his main foe. There is a difference between the two, though. As IM Greg Shahade noted in one if his brilliant articles, Nakamura has kept his super-duper rating playing almost exclusively elite events, facing the strongest players in the world, whereas Wesley So has played a plethora of opens to reach his stellar rating. Also, Nakamura is a very experienced player, and this year he's trying to conquer his fourth title in St. Louis. Another player who cannot be forgotten in the list of favorites is the 4 times and defending champion Gata Kamsky. We all know how strong can Gata be and, even though lately he's not played at his best, he's always dangerous for any player. Last but not least, Ray Robson - though he's not at the same level as the first two - could be a relative surprise in this amazing Championship. Irina Krush is of course the favorite in the Women US Championship. Her rating is 150 point higher than her immediate follower's, WGM Tatev Abrahamyan. Irina is chasing her 7th title, and 4th in a row. The super-favorite Hikaru Nakamura wins the first game of the Championship against GM Holt, not without some thrilling moment. Hikaru sacrificed a pawn to gain mobility and keep his chance of a king-side attack open. But it wasn't 100% clear whether the sac was sound. Anyway, Holt found himself in time trouble and did not play at his best, allowing Nakamura to show his class and win the game with a very nice mating net. Welsey So won his game against Naroditsky, Robson won against Troff and our commentator Varuzhan Akobian won an interesting rook ending against the youngest participant in the Championship: GM Sam Sevian. An exciting first round in St. Louis! 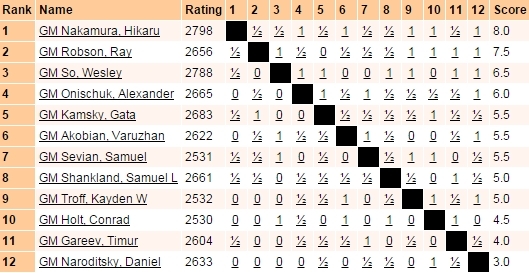 As one would expect, Hikaru Nakamura and Wesley So lead after two rounds, with 2 out of 2. But it was a totally different story which characterized their games. Nakamura made it look easy against Akobian; Naka played apparently simple chess, not giving a chance to Var to come out of game alive. Wesley had to play a very long game against Shankland. After missing some good winning chances, Wesley found himself stuck in a dead drawn endgame, which tiredness and time pressure turned into a blunder galore. Shankland had a real chance - after a long series of unbelievable mistakes - to draw the ending, but he blundered just one time too much, and had to resign. 90+ moves and 6 hours of play can undermine even young and strong players' strenght and confidence! Holt won a nice game against Gareev, and Troff won with Naroditsky, who now sits at the bottom of the standings with zero points. Nakamura and So 2.0/2, Robson 1.5/2, and then Onischuk, Akobian, Kamsky, Troff and Holt 1.0/2. What a round! In a super-complicated and tactical game, the 15-year-old GM Sam Sevian beat Wesley So, in an unexpected upset. Hikaru Nakamura got a won position against defending champion Gata Kamsky, but missed a defending move that allowed Gata to force a draw. Ray Robson won again, and now leads with Nakamura, at 2.5/3. Wesley So is alone in third, with 2.0/3, followed by Kamsky, Onischuk, Akobian, Troff and Sevian half a point behind. One interesting note about the game Akobian-Gareev. The first moves were simply stunning: 1. d4 d6; 2. Nf3 h6; 3. 4e g5. A very unusual way to start a game by Timur Gareev, especially in a top event like this. Timur managed to draw, and in the post-game interview he said it was not so strange to play that way: "Didn't Spassky play that line?" - A light note in a really eventful and somewhat thrilling day in St. Louis. After three rounds full of decisive results round 4 ended with 6 draws, leaving the standings unchanged. But it was not a boring round, with hard-fought games and Timur Gareev keeping up with his eccentric opening choices. Today Timur played the Wing Gambit in the Sicilian, not an opening you see every day in top level events: 1. e4 c5; 2. b4. The clou game was, obviously, Nakamura vs. So. It was a long struggle; Nakamura got into a rook and bishop ending a pawn down, but he was able to draw the game. Tomorrow round 5, before the only rest day. Hikaru Nakamura and Ray Robson lead the tournament, followed by Wesley So half a point behind. Nakamura wins in a convincing way against Naroditsky, with a thematic exchange sacrifice in the Sicilian Dragon, and is now the sole leader after 5 rounds. Robson . who shared first with Naka after 4 rounds - lost to Kamsky, that won his first game in this Championship. Wesley So regulated Timur Gareev - the most creative player in the tournament - and now is second, half a point behind Nakamura. Going into the only rest day of the event, it looks like the three favorite winners have re-established the hierarchy. Nakamura is on top with 4.0/5, followed by Wesley So with 3.5, then Kamsky, Robson and Troff with 3. Kayden Troff won a whirlwind game against Holt today: he was totally lost when poor Holt threw away the game in a dramatic way. It was quite a rollercoaster! Four decisive results in round 6, with the main one being Robson's win over Wesley So. It's been an up-and-down game, far from perfect, but really dramatic. Another interesting game was Holt-Akobian. Varuzhan seemed to have the win at hand, but in time trouble Holt was able to turn the table, and win apretty lost game. Veteran GM Onischuk beat the defenidng Champion Gata Kamsky, with a very well played ending. Sevian saving an amazing ending won his game against Troff. The standings after 6 rounds see Nakamura leading solo with 4.5 points, followed by Ray Robson half a point behind; one full point from the leader are Wesley So, Alexander Onischuk and Sam Sevian. Another WOW! round in St. Louis, with 5 decisive results, and a lot of interesting games. Onischuk played a novelty in his game against So, and it seemed to be a sound one; Alexander wasn't able to convert the good position into a real advantage and lost the game, but it's very likely that his 17. ... Bf5 will be seen again on the board. Ray Robson had to win his game twice, after missing an easy win and see himself forced to play very carefully to avoid perpetual check. With his win, Ray joins Nakamura in the lead. Sevian is having a good tournament: today Sam managed to hold Nakamura to a draw, which is not the easiest thing in the world to do. The other youngster - Kayden Troff - beat Var Akobian, who blundered a pawn early in the game and had to entry a difficult endings. Gata Kamsky - who is having an up-and-down tournament - got back to win today, against Holt. After this amazing 7th round, Nakamura and Robson lead with 5.0 out of 7, followed by Welsey So half a point behind. A full point behind the leaders, Kamsky, Sevian and Troff. Nakamura got back his solo leadership, running over Troff like a steamroller, while Robson drew with a good Shankland and So lost with Holt. Probably So knows that Nakamura is going to win a lot of games during this tournament, and he takes more risks trying to keep pace with the super-strong Hikaru; in any way, with his third defeat So is probably out of competition for the title, and Nakamura seems to be launched toward his fourth championship. Naroditsky, who is having a nightmarish tournament, lost to Onischuk, and Gareev - finally playing a solid and well known opening - won convincingly against young Sevian. Akobian and Kamsky drew in 27 move in a Grunfeld. After 8 rounds, and with three rounds to go, Nakamura leads with 6 points, followed by Robson with 5.5; one point behind Robson - at 4.5 - Kamsky, So and Onischuk. It's impossible not to talk about what happened to Wesley So in the 9th round of the US Championship. Wesley was forfeited 6 moves into the game with Var Akobian, for "illegally taking notes". FIDE regulations clearly state that it's not allowed to write anything but the moves on the scoresheet. Apparently So was scribbling self-encouraging phrases on a sheet of paper positioned underneath the scoresheet. Akobian told the head arbiter that he found what So was doing very unusual, and the arbiter, having warned Wesley So twice during the tournament, decided to forfeit the top-tenner. It's always bad when something like this happens, especially in a relevant and important tournament like the US Championship. The Internet Chess World has got the frenzies now, and everyone is expressing their own opinion on this "scandal". The result of Wesley's forfeit is that now he's out of the run for the title, with his 4th loss in the tournament. Nakamura and Robson drew, as well as Kamsky, Shankland and Onischuk. Naroditsky won - and it's great news - against Holt, in a pretty convinging way. With two rounds to go, Nakamura is in the sole lead, followed by Robson half a point behind and then Kamsky and Onischuk 1.5 points behind the leader. Tomorrow Nakamura and Robson will play for the title, in what is announced to be the most important game of the whole tournament. It could have been the 'final' round, but after just a few moves it was clear that neither Nakamura nor Robson were pushing hard for a win in the game that could have decided the tournament. They played super-solid and very accurately, to reach an equal position and agree on the draw. The old lion Alexander Onischuk took advantage of the leaders' draw, and by beating young Sevian with a positional masterpiece, put himself back in the run for the title. Now Nakamura leads with 7 points, followed by Robson with 6.5 and Onischuk with 6. There are a lot of different scenarios to take in consideration. In the last round Nakamura plays Onischuk, and a win by the experienced Alexander could force Naka into the playoffs; Robson plays Gareev, the most interesting - and unpredictable - player in this US Championship. Everything can still happen, and it'll be fun to watch the last round! On a positive note, Wesley So bounced back brilliantly after the shocking forfeit in round 9: he won a nice game against Gata Kamsky, who probably tried to win a bit too hard in this game. Gibraltar, Zurich and now the US Championship. So far, it's been Hikaru's year. Hikaru conquered the US Championship by winning round 11 against Alexander Onishuk, in a pretty amazing way. The game looked like a draw, and everyone knows how solid Onischuk is in such positions. But the old lion miscalculated in a drawish endgame, and nobody can allow himself that when playing the number 3 in the world. Robson did his part, beating Timur Gareev in a crazy game, and until Onishuck's blunder, we were all preparing for the playoffs. Nakamura said that the tournament wasn't easy for him: when playing much lower rated opponents, you need to push it hard and try to win every game. But Hikaru was able to play well, and grabbed his fourth natioanal title. Welsey So, once again, showed he wasn't affected too much by the incident in round 9, and won against Troff. Irina Krush, after an up-and-down tournament, managed to draw the last game against Nemcova, winnning her 7th Championship title. Congratulations to the champions! I m new to the club and have had some problems tuning in to live events. I’m sure it’s a stupid question, but how do I go about this, particularly for the US Championship. Thanks friends. When is Caruana going to be in the US open?? ?